Eight people A, B, C, D, E, F, G and H are sitting in the rectangular table. Only three people are sitting in the longer side to the table. And only two people sits in the shorter side of the table. The person who sits at longer side of the table are facing inside the table and the person who sits at shorter side of the rectangle are facing outside the table.All the information is not necessary to be in the same order. Only two people sit between F and G. H sits second to the left of F.C is neither an immediate neighbour of F nor G. Only two people sitbetween E and A. 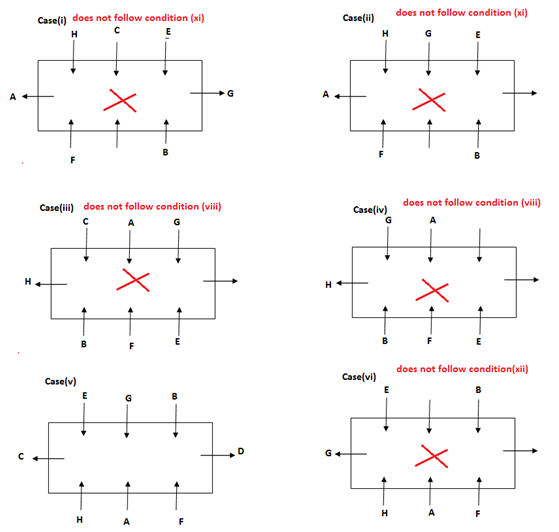 B does not sit at shorter side of the table.F does not sit at shorter side of the table.C neither faces A nor E.Neither E nor A is an immediate neighbour of D. F is not an immediate neighbour of E.B sits second to the left of E, neither of sits at shorter side of the table.D neither faces C nor G. B is not an immediate neighbour of C.
Who among the following person sits second to the right of C? 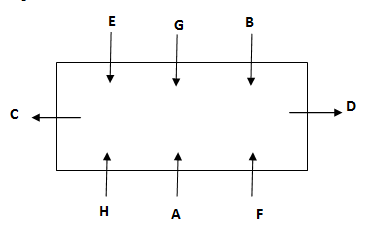 i).Only two people sit between F and G.
ii).H sits second to the left of F.
iii).C is neither an immediate neighbour of F nor G.
iv).Only two people sit between E and A.
v).F does not sit at shorter side of the table. vi). B does not sit at shorter side of the table. vii).C neither faces A nor E.
viii).Neither E nor A is an immediate neighbour of D.
ix).F is not an immediate neighbour of E.
x). B sits second to the left of E, neither of sits at shorter side of the table. xi). D neither faces C nor G.
xii). B is not an immediate neighbour of C.
Who among the following person sits second to the left of A? 5. Name the person who sits fourth to the right of C? What is the code for the word ‘ridiculous string’? What is the code for the word ‘back seeking’? What is the code for the word ‘article’? 9. What is the code for the word ‘demand’? 10. What is the code for the word ‘string’? Eight people A, B, C, D, E, F, G and H are sitting in the rectangular table. Only three people are sitting in the longer side to the table. And only two people sits in the shorter side of the table. The person who sits at longer side of the table are facing inside the table and the person who sits at shorter side of the rectangle are facing outside the table. All the information is not necessary to be in the same order. Only two people sit between F and G. H sits second to the left of F. C is neither an immediate neighbour of F nor G. Only two people sit between E and A. B does not sit at shorter side of the table. F does not sit at shorter side of the table. C neither faces A nor E. Neither E nor A is an immediate neighbour of D. F is not an immediate neighbour of E. B sits second to the left of E, neither of sits at shorter side of the table. D neither faces C nor G. B is not an immediate neighbour of C.
1) Who among the following person sits second to the right of C? 3) Who among the following person sits second to the left of A? 4) Four among the five are alike in such a way based on their certain arrangement, find the one who does not belong to the group? 5) Name the person who sits fourth to the right of C? 6) What is the code for the word ‘ridiculous string’? 7) What is the code for the word ‘back seeking’? 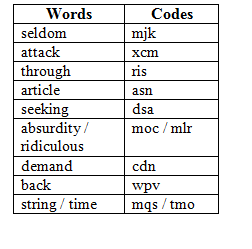 8) What is the code for the word ‘article’? 9) What is the code for the word ‘demand’? 10) What is the code for the word ‘string’?